Serving is an important way for our young people to become involved in the spiritual life of the Church. Altar servers add to the solemnity of the Mass and make it an offering that includes all generations. It gives youth an opportunity to understand the rewards of service toward others and their community. Of all those that contribute service during a Mass, outside of the priest, it is the servers who are most closely involved in the proceedings. St. Stephen’s currently has about 20 altar servers. There are training sessions roughly every two months to incorporate new servers into the routines of the Mass, to improve the skills of experienced servers, and to prepare for special Masses and services such as Easter and Christmas. These training sessions are a blend of instruction and social activities such as a pizza party and games. Special feast days also may require more than the usual number of servers. Generally speaking, there are three positions for servers. Those new to serving are acolytes, candle bearers. There are usually two of them serving with the more senior cross bearer. It is the cross bearer who handles the more complex work of bringing articles to and from the altar, holding books for the priest to read, and ringing the bells. 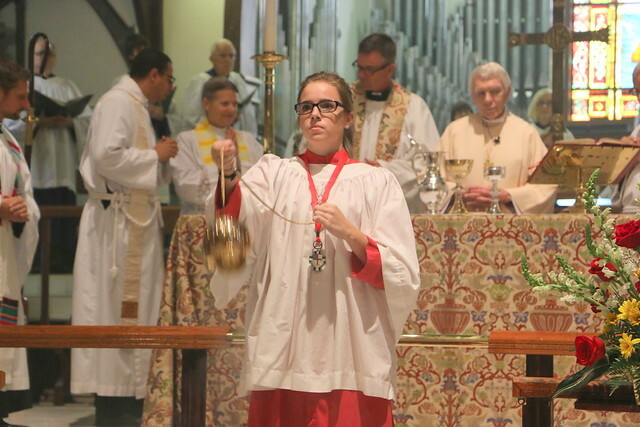 Those senior servers who wish to learn more may serve as thurifers (incense handlers) during the special Masses of Christmas and Easter. Servers have gotten younger over the years. To be a server now a boy or girl should be tall enough fit a cassock and mature enough to take on the responsibility of serving. Until fairly recently, serving used to be for boys only, and altar boys in the past were usually trained by the priests. However, due to shrinking numbers of priests and the subsequent work overload, this job began to be shared by lay members of the congregation. In the early 1990s girls began to train for serving and within a few years formed half of the serving body. Today, along with boys, senior girl servers take a leadership role in mentoring their younger counterparts. A highlight for the altar servers has always been the annual picnic held each summer. Many former servers will remember the picnics at the Kilty family cottage at Cultas Lake in the days of Father Bill Kilty. After Father Kilty’s retirement, the picnics sometimes took on other forms. These included trips to other lakes, to bowling alleys, or to water slides. Whatever the venue, the altar servers have always had a good time. The youth that dedicate themselves to altar serving do so with the sincere gratitude of the parish. They take their duties seriously and their presence enhances our devotions. It would be difficult to visualize a Sunday Mass without them.